Search engines like Google and Bing are constantly updating and tweaking their algorithms and some major updates from Google are coming. Where the big search engines go you can expect other search engines to follow if they haven&apos;t already gone down that road. The latest news from Google targets mobile user experience and secure websites. Bing and Google are extremely interested in the user experience for mobile users and have issues various guidelines on that. 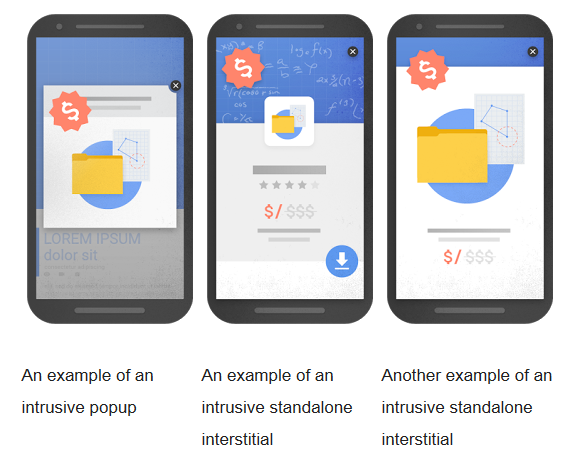 Recently, Google has announced they&apos;re targeting popups and interstitials, especially those that hinder the user&apos;s access to the page content. In their August 23, 2016 Webmaster Central Blog post, Google announced that beginning January 10, 2017, pages where content is not easily accessible to mobile users may not rank as highly as other pages. So what is Google defining as a website frustrating users with less accessible content? They&apos;ve identified that popups that completely covers the page content immediately when the page is loaded or displays when the user is reading the page as an intrusive behavior. Other examples include displaying an interstitial that the user has to close before they can read the content or where the content is tucked into the interstitial "below the fold." Google&apos;s examples of content rendered less accessible to mobile users. All is not lost for your on-site marketing efforts, however! Google provides examples and use cases where these cases are perfectly acceptable when used correctly. If the interstitial is in response to a legal obligation, such as notifications for cookies or age verification, this will not adversely affect your rankings. Other examples include login dialogs for websites where the content is not available for public indexation and reasonably sized banners. 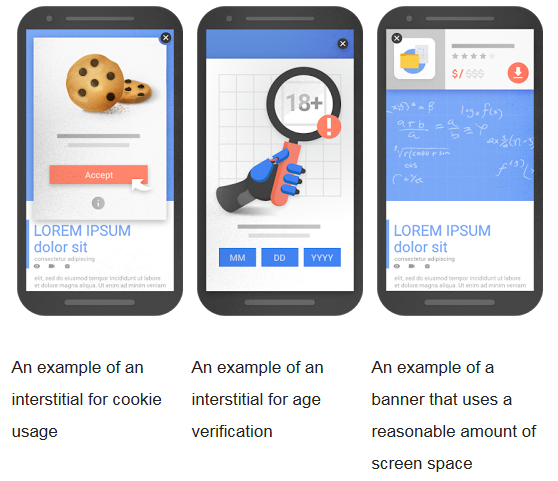 Google&apos;s examples of acceptable interstitial and banners when used responsibly. How do you prepare? Review all of your popups, banners and interstitials to ensure they are complying with Google&apos;s stated preferences for appropriate behaviors. While the new signal won&apos;t take effect until January, it&apos;s better to review things now and prepare. Launch your new interstitials as soon as their ready so you&apos;re ahead of the game when it comes to your competitors and deliver an easy, friendly, mobile experience. 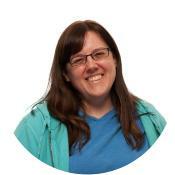 More on this topic is available at the Google Webmaster Central Blog. Google&apos;s other big change that will impact all websites is their increased visibility for secure websites. You&apos;ll hear it referred to as SSL (secure socket layer), "secure" or HTTPS, but they&apos;re all referring to the same thing. In this past, this was more important for ecommerce websites to help encrypt user&apos;s credit card data, but Google has since been promoting secure websites for the entire internet. Beginning in January 2017, Chrome will begin marking pages that collect passwords or credit cards as non-secure if they are not using HTTPS connections. While that does not directly impact websites that are strictly informational in nature, this is part of Google&apos;s long term plan to mark all non-secure websites with a warning message. Currently, Chrome provides a flag at the top when a site is secure, but through user research, discovered that many users didn&apos;t notice that there wasn&apos;t a padlock symbol to indicate they were secure. Beginning in January 2017, Google will be flagging the website as "Not secure" in the browser&apos;s address bar. Eventually, all non-secure sites, whether logins or credit cards are required, will display a much stronger indicator, though there isn&apos;t a set date to that yet. Why should you care now if that&apos;s not until some undefined date? There are a few solid reasons for making the transition to a secure website if you haven&apos;t already. Google already announced in August 2014 that HTTPS had become a ranking signal. While this may not have a huge impact now, it&apos;s possible it could become a stronger signal with this new push. Another reason is due to the number of Chrome users will be seeing the new messaging in their browsers. Some estimates on Chrome usage online indicate that close to 50% of traffic worldwide in August 2016 was through Chrome. More on this topic is available at the Google Security Blog.